Description: A small Doto of the coronata group, with typically 6 pairs of cerata in adults. The ceratal tubercles have terminal, round, maroon-red spots and extra irregular red spots. The body is white with sparse mottling of red pigment. The rhinophore sheaths have white pigment on their margins. 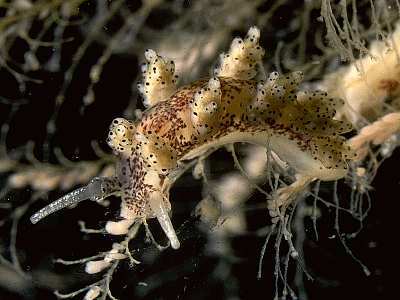 Habitat: This animal feeds exclusively on the plumulariid hydroid Plumularia setacea. This hydroid grows on larger hydroids such as Nemertesia antennina and Nemertesia ramosa. A larger form of Plumularia setacea also grows amongst sponges in rapids or strong currents, and may also harbour Doto millbayana. Distribution: Recorded from the western coasts of the British Isles and the Irish Sea and as far north as Shetland. This species was described in 1976, therefore there is a need for additional new records. Red pigment spots on and between ceratal tubercles and on body. Conspicuous white rim to rhinophore sheaths. Picton, B.E. & Morrow, C.C. (2016). Doto millbayana Lemche, 1976. [In] Encyclopedia of Marine Life of Britain and Ireland.